The FBS G5 game of the week pits two American Association Conference teams playing in each other’s conference opener this week with two top 5 CSJ Sagarin Top 25 ranked facing each other with Memphis visiting Central Florida. But this game is not the only game pitting two Top 25 ranked teams in our poll. Five other such games also will take place this week. The other games are #2 Houston plays at #25 Temple, #13 Northern Illinois at #4 San Diego State, #7 Navy at #18 Tulsa, and #15 BYU at #24 Utah State (Friday). No Power 5 match-ups involve any of the Top 25 teams as we are starting to get into conference play. Regardless, It should be another fun weekend and entertaining to see how these games play out as we race towards which Group of Five school will get the New Year’s Six Bowl bid. UCF’s Spectrum Stadium, Orlando, Fla.
UCF and Memphis were originally scheduled to play on Sept. 9, but the game was postponed due to Hurricane Irma and will now play this week. 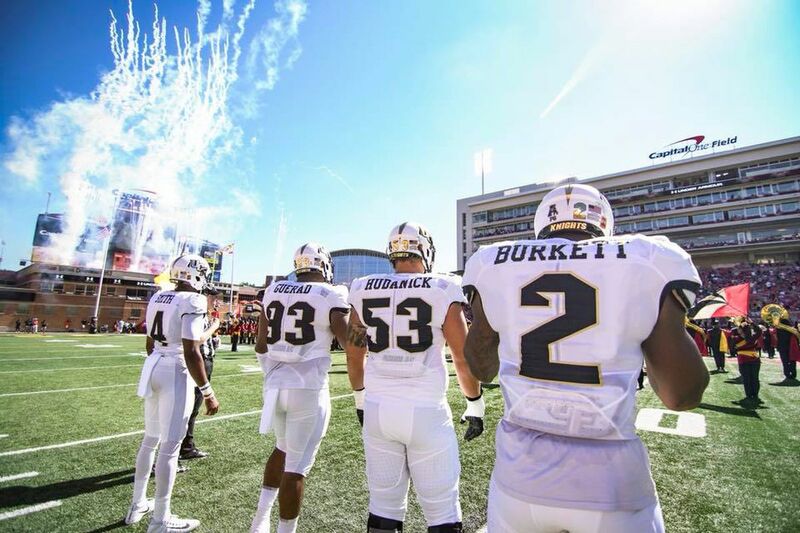 In his first stint as a head coach, Scott Frost took over a winless UCF team from 2015 and turned it into a 6-7 squad that earned a bowl berth in 2016. The Knights have continued that momentum, starting the 2017 season with a 61-17 home win over FIU and a 38-10 road win at Maryland. The victory over the Terrapins was UCF’s second ever win over a Big 10 opponent and the first since winning at Penn State in 2013. The Knights’ offense has been extremely efficient through two games, ranking second in the nation with 49.5 points per game and 18th with 308.5 passing yards per game. Like last season, UCF’s defense has also stepped up to the plate, ranking third in the nation in both third down defense (16%) and turnover margin (+2.0). The Knights are also eighth in the nation, allowing just 88.0 yards per game rushing. Sophomore quarterback McKenzie Milton has improved on his stellar freshman campaign, currently sixth in the nation in passing efficiency (183.7). He has thrown for 538 yards with five touchdowns and just one interception in two games. Shaquem Griffin has been the leader on defense last year and thus far this season from his outside linebacker position. Memphis has started 2017 with three straight wins, including a 48-45 victory over then No. 25 UCLA and defeated FCS Southern Illinois 44-31 last week. The Tigers are scoring 43.0 points per game in three victories. They are led on offense by quarterback Riley Ferguson, who has 783 yardspassing and eight touchdowns, in addition to one rushing touchdown. This is the tenth meeting all-time for these two squad with UCF holding a 9-1 mark. The last time these two played resulted in a wild finish in UCF’s victory on Oct. 5, 2013. UCF scored a pair of touchdowns on fumble recoveries in a span of nine seconds in the final two minutes to win 24-17. I think this game will result in a similar fashion but will will be a little higher scoring. I like the home field for the Knights though to come through and prevail in this match-up of undefeated teams. I will take UCF by a touchdown. My picks are the ones in BOLD.